After we talked about how to organize your playbook earlier this week, we focused mostly on creating and editing your categories. We specifically talked about it from the point of view of a coach using our football software, but the same would apply if you use basketball playbook software or any other package of our software for coaches. 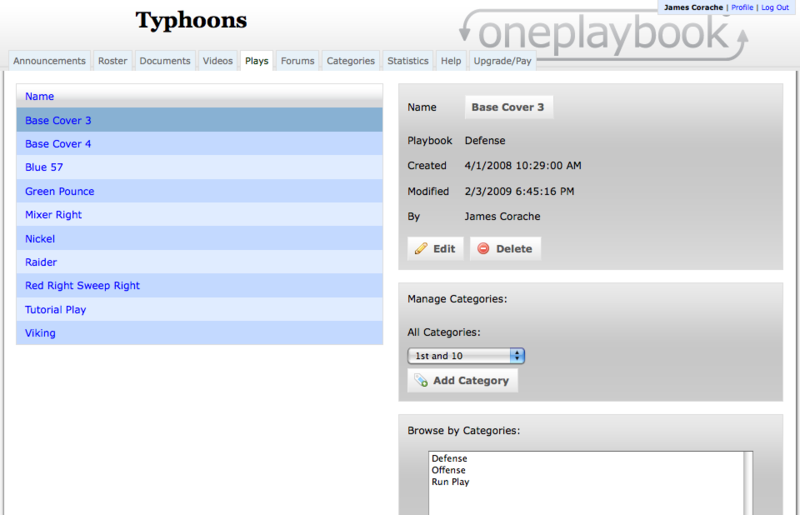 Our Base Cover 3 play has not been categorized: notice how there is no “Delete Category” button. Now that you’ve created your categories, how do you use them? How do they help your team? You can use categories for documents, videos or plays, but we’re going to talk about how to use categories to organize your playbook. 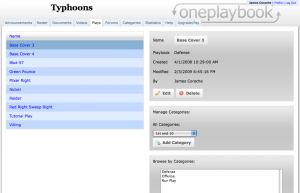 Our first play selected, “Base Cover 3″ is not in a category. When we create a new play, it is not in a category and has to be put into one. You can also tell that it is not in a category because in the Manage Categories box on the right, there is an “Add Category” button, but no “Delete Category” button. We’re going to take that play and just above the “Add Category” button, we’re going to select “Defense” and then press the button. We’ve added Base Cover 3 to the “Defense” category. Notice how the “Delete Category” button is visible now. Notice that there is now a “Delete Category” button. This lets us remove something from a category if we want. Below the Manage Categories box, there is another box: Browse by Categories. This area is the heart and soul of categories and is very important as you add more and more plays to your online playbook software. Right now we have ten plays for simplicity, but when you have one hundred plays or more in your playbook, categories are crucial. 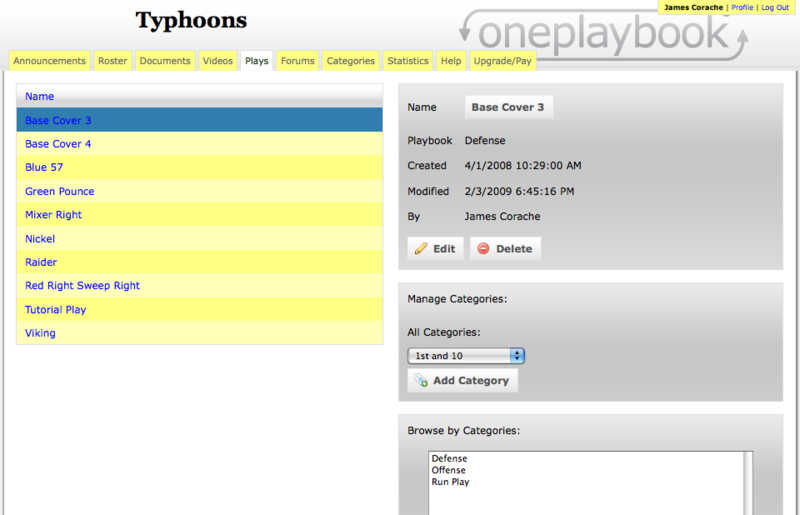 We’re going to select “Defense” in the Browse by Categories area, and then press the “Get Plays in Categories” button. Now there are only two plays showing. These are the plays that are under the category “Defense” and only the plays that are under that category. 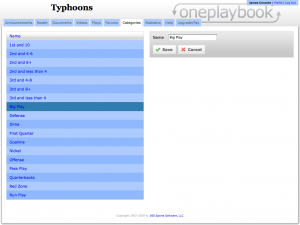 This way, if your player is only looking for certain kinds of plays, he can quickly and easily find them. To go back to the full, list, all we have to do is press the “All Plays” button, and all of the plays will show again. 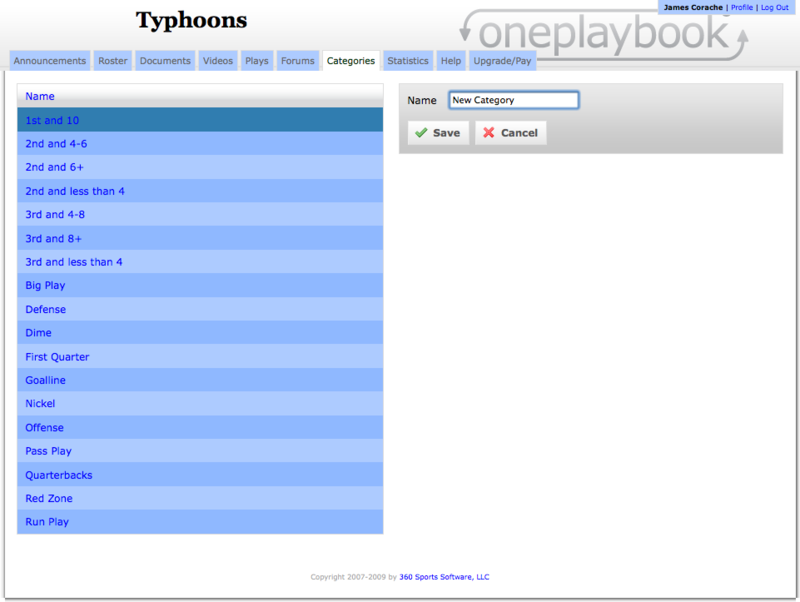 What we can also do is select multiple categories at once. This is where the true strength of OnePlaybook’s categories lie. We’re going to search for both “Offense” and “Run Plays” by selecting both of those categories in the Browse by Categories area. This will give us only plays that are filed under both categories. Looking under “Offense” and “Run Plays” gives us one play that’s categorized under both. Going back to our football software example. 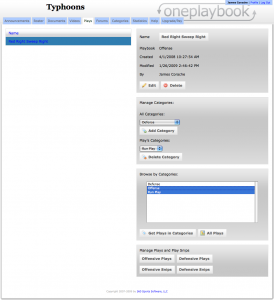 Say you’re offensive tackle logs into your OnePlaybook account. He can go to your Plays tab and see all of your plays, but a lot of those don’t matter to him. What he can do is look for all of your “Offense” plays or “Run Plays.” Or he can look for “3rd and Long,” “Shotgun,” “Four Wide Receiver,” “Slide Protection” plays. Now he gets a list of one or more plays that fit those criteria and quickly finds what he is looking for. Categories are a very powerful feature that any coach can benefit immensely from. As coaches, it’s easy to have a lot of different plays to use in a lot of different situations. Sometimes, having so many plays can lead to an encyclopedia-sized playbook, which not only doesn’t lead to a very green playbook, it can also confuse your players. Say, for example, you’re a football coach. 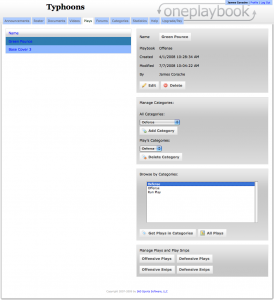 You’ve started using our software for football coaches, but you find that you’ve added a lot of plays to your online playbook. You don’t want your players to get confused because they’re looking at a ton of plays all in one place. They may only be looking for one kind of play or their only looking for your offensive playbook or special teams playbook. 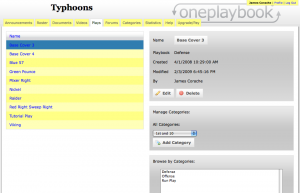 A typical football team's categories for OnePlaybook. Categories is your answer. When you have a play, there are often a lot of ways to describe it. 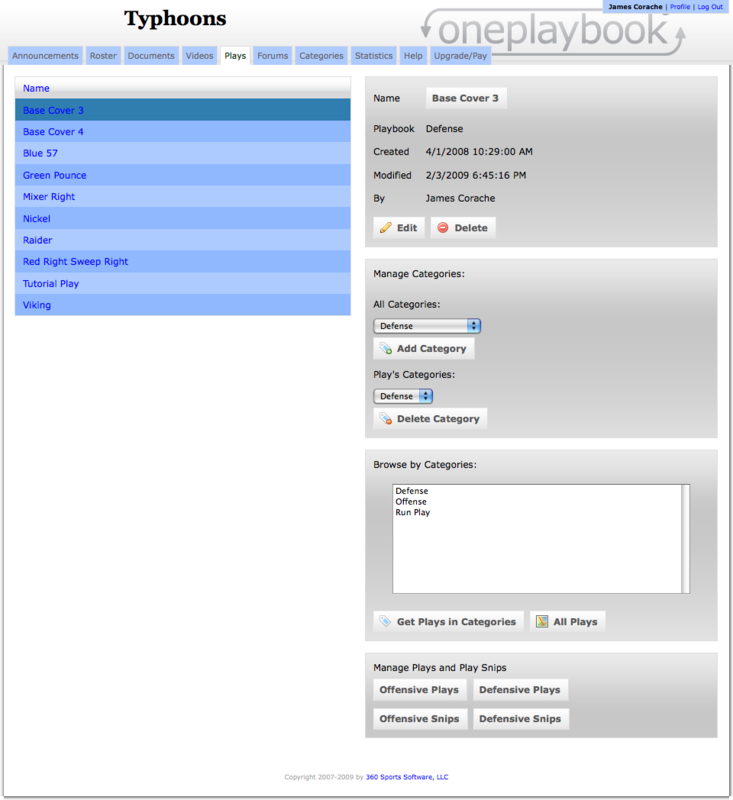 Back to the football playbook software example, you can use categories to designate run plays, offensive plays, power plays, any possible options that you might want. Some coaches might make categories based on position, down-and-distance or field position. The beauty of categories is that as a coach, you have full control over what they are and what they do. In this tutorial we’re going to go over how to add and edit categories as well as what you can use them for. You can add as many categories as you like and name them whatever you would like. 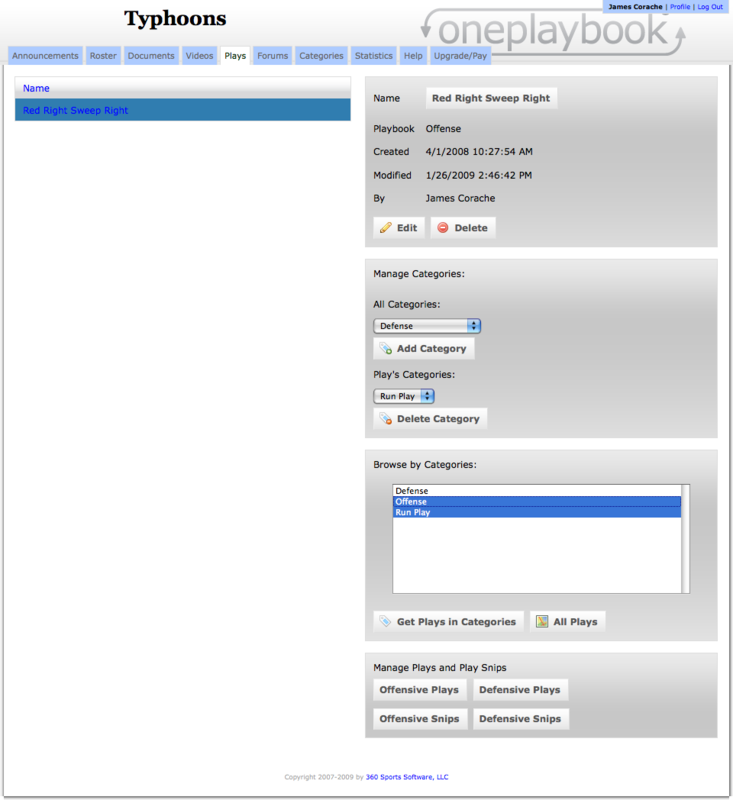 There will be another tutorial about how to categorize your plays in your online playbook. Adding a new category is very easy. 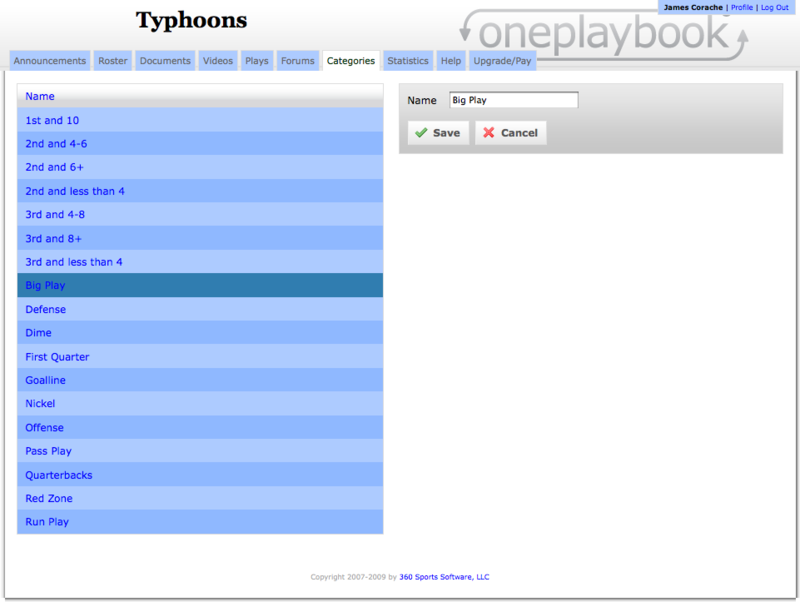 Press on the Add button on the right, and a new text box will appear where you can type in the name of your category. 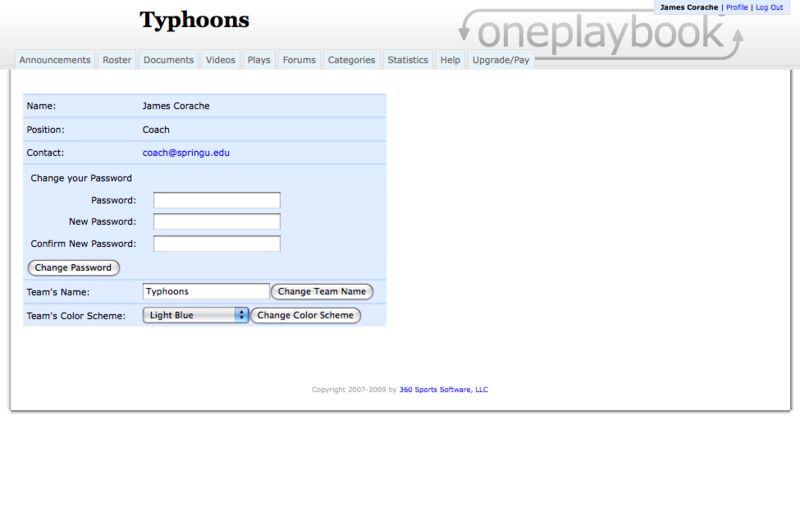 Creating a new category for our football team's playbook software. The new category is added immediately and is ready for you to use to get your team more organized. Again, categories can be anything you would like. If you want to use categories for Documents, then you can add a category like “Medical Forms,” “Workout Plans,” or “Schedules.” They are very flexible and easy-to-use. If you’ve named a category and realized you mistyped something or that you want to change them name, you can always delete it, but you can edit that category as well. Quickly and easily change the names of your categories. Just click on the category on the left, and its information will be shown on the right. Pressing on the Delete button deletes that category, and the Edit button lets you change the name of the category. Simply Save, and move on your way to another feature of our online coaching software. Every team has their own colors and their coaching software and playbook should reflect that, right? Right. 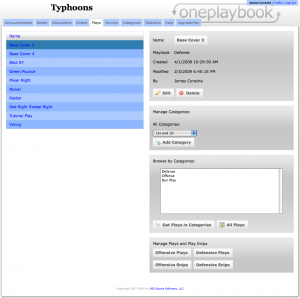 Here we’ll walk through how to make OnePlaybook your own and change the color scheme as well as show some of the color schemes available. The default color scheme for your coaching software account: Light Blue. 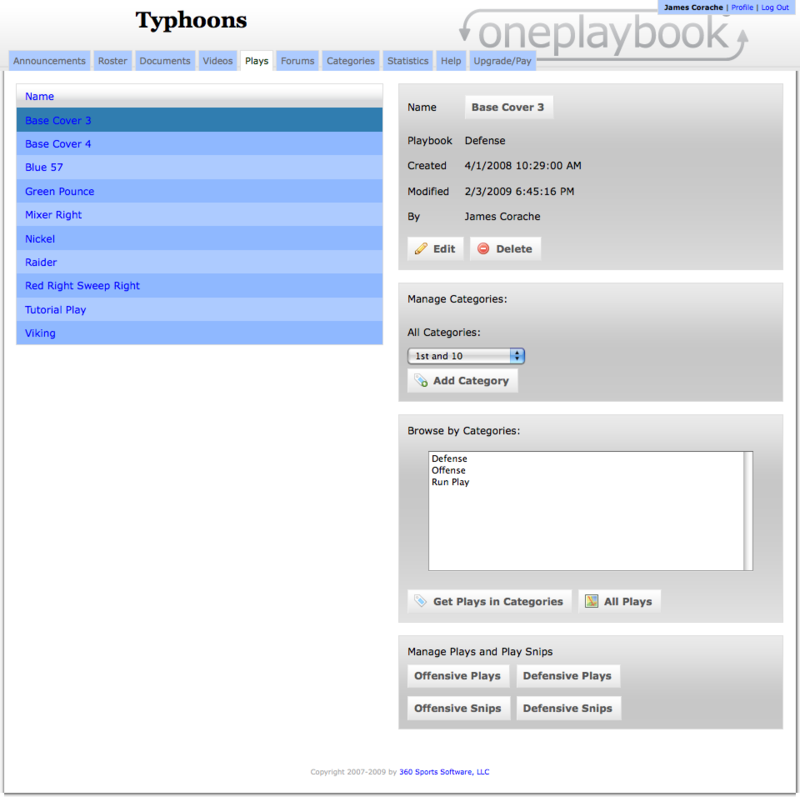 What you’ll notice on the right is the color scheme that every OnePlaybook team starts with. The color scheme is named “Light Blue” and is the basic color scheme. You can change your team’s color scheme by navigating to the profile page by clicking on the Profile link at the top right. The bottom option allows a coach to select which color scheme they would like to have. The layout, usability and useage of your web application for coaches will not change, just the colors of items within it. Change your coaching web application's theme in your profile page. There are currently eight different color schemes a coach can choose for his team, but if you can request an additional color scheme for your team and we would be happy to add it. Now we’ll show a few of the different color schemes available for coaches. A red theme is available for teams. So, whether your the Cardinals, Red Raiders or other team, you can have a red color scheme for your team. 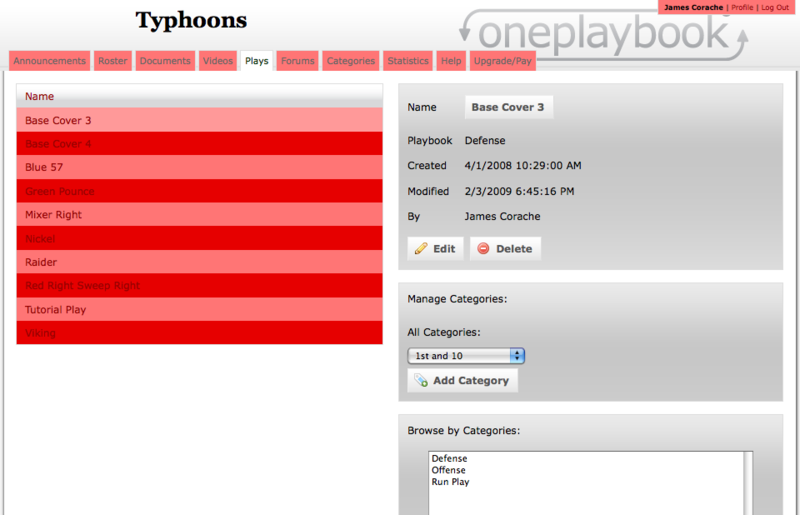 OnePlaybook's online coaching software's Red theme. Another popular color scheme is the Blue and Yellow theme. Again, you can notice that even though the colors change, the layout and functionality of your coaching software stays the same. 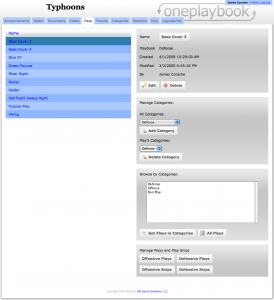 This means that even if you change your color scheme often (maybe you want your players to see the color scheme of your next opponent to get them psyched-up), your players will always know exactly what’s going on and how to use your OnePlaybook account. Your software for coaches can also be colored blue and yellow. In all, the eight color schemes currently available are Light Blue, Dark Blue, Light Green, Dark Green, Purple, Red, Blue and Yellow, and Purple and Yellow. 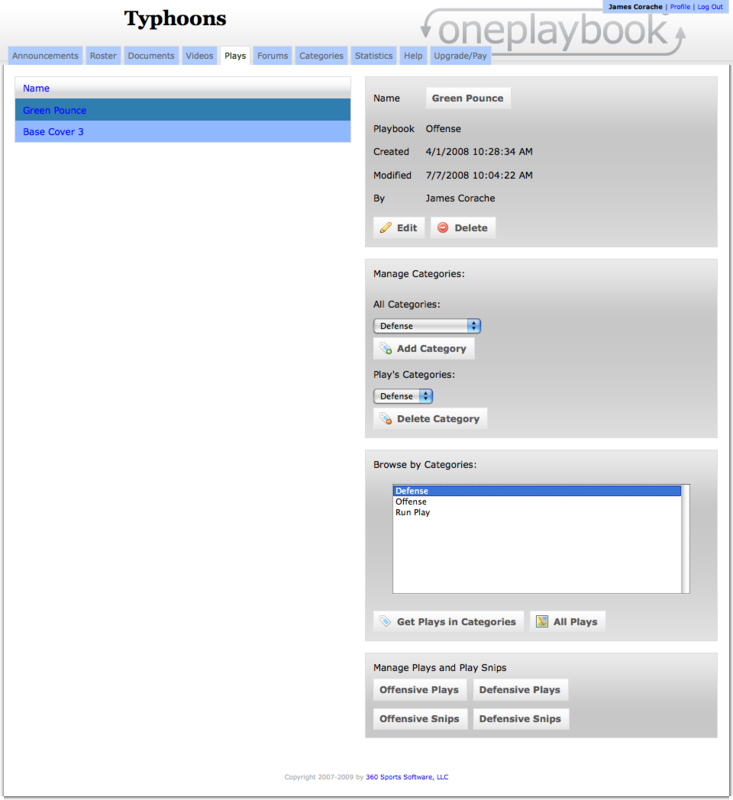 Since OnePlaybook builds the software coaches want, you can always request an additional or different color scheme as well.